Wipe Aide is the most useful tool for toilet training available for kids. Wipe Aide, which moistens your dry toilet paper, is an easy to use, environmentally friendly, plumbing safe alternative to, so called, “flushable” wipes and wet wipes. Wipe Aide is perfect for helping toddlers with their toilet training and keeping the whole family cleaner and fresher after using the bathroom. Hey mom, “No more underwear stains or streaks.” Wipe Aide is a great option to feminine wipes and adult wipes. Wipe Aide won’t clog toilets and its septic safe and you won’t have to worry about a sewer backup. Why buy a bidet when Wipe Aide will save you hundreds and hundreds of dollars and its hassle free. 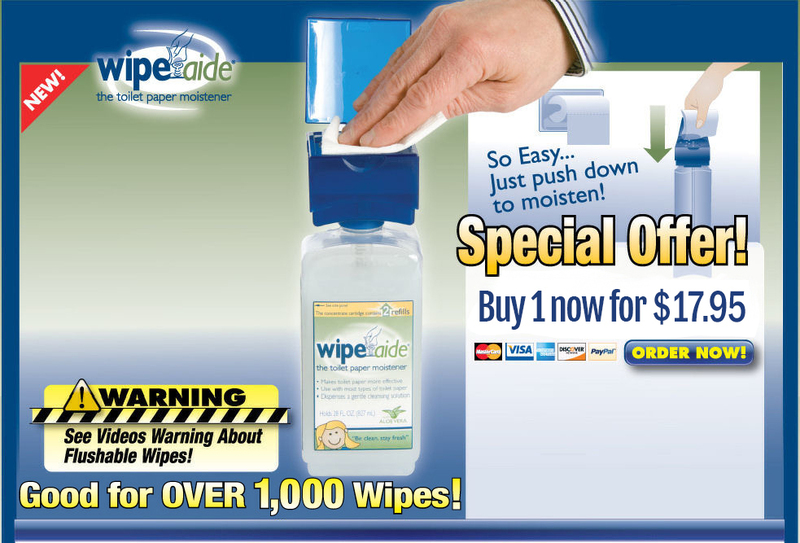 You could call Wipe Aide the “Bidet in a Bottle”. Buy Wipe Aide today. You’ll wonder how you ever did without it!